Food, glonous food. — Writing… or Typing? You are here: Home / daily life / Food, glonous food. LOL Someone made the ri into n. My handwriting is like that! Does this mean you feel better and got out? I think it actually says “cultual” too. 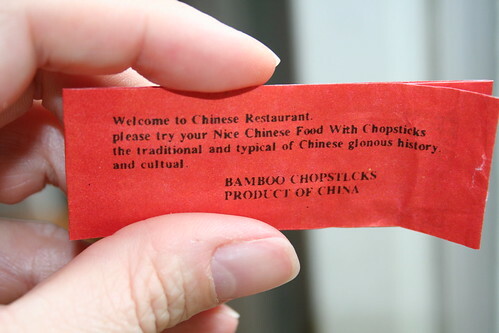 The Chinese place I favor has chopsticks in a wrapper that is similar but not identical to that. RE the “Breakfast Club” commercial: I’m with you 100%. Adorably cute! Thanks for posting the photo!